Cuttin' Edge Ranch Longhorns is the only Registered Longhorn Breeder recognized by the TLBAA in Arizona! The Texas Longhorn became the foundation of the American cattle industry by claiming first rights in the untamed, newly discovered Columbus brought Spanish cattle to Santa Domingo, and within two hundred years their descendents would be grazing the ranges of Mexico. In 1690, the first herd of cattle, only about 200 head, were driven northward from Mexico to a mission near the Sabine River- a land that would become known as Texas. The early missions and ranchers would not survive all of the elements. But the Texas Longhorn would. In 1972, the Federal government helped to preserve the Texas Longhorn and a great part of our American heritage. 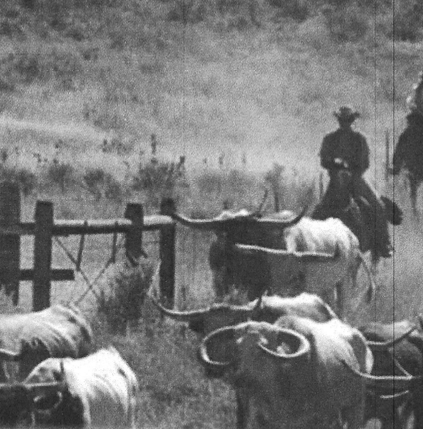 With only a handful of Texas Longhorns roaming the ranges in private herds, Congress appropriated $3,000, and assigned forest service rangers, Will C. Barnes and John H. Hatton to the task. The purpose of the Association was to recognize the Texas Longhorn and its link with American history, to promote awareness of Texas Longhorn cattle, to recognize present breeders, to encourage other to develop and maintain herds and to preserve for posterity this magnificent breed of cattle.